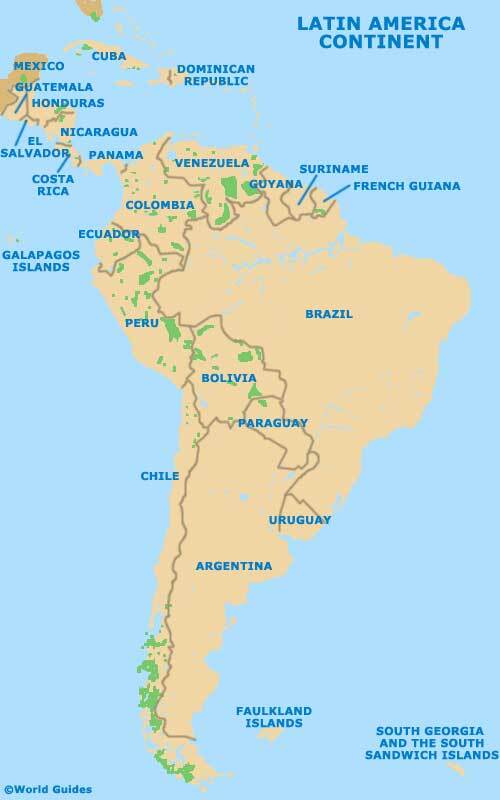 Latin America contains a diverse selection of countries, which are spread amongst three main regions - the Caribbean, Central and South America. With a population now topping 600 million, many residents of Latin America speak either Spanish or Portuguese, often being direct Native American descendants. After the famous voyages of Christopher Columbus at the end of the 15th century, Europeans began to colonise areas of the Americas, bringing with them their own religious beliefs and lifestyles. Brazil covers a sizeable chunk of Latin America and this vast country is the continent's largest by far, being edged by the Atlantic Ocean on its easterly coast. Argentina is another important country and lies to the south, where it is also bordered by Bolivia, Chile, Paraguay and Uruguay. Other noteworthy countries include Colombia, Cuba, the Dominican Republic, Ecuador, El Salvador, Guatemala, Haiti, Honduras, Nicaragua and Venezuela. When it comes to tourism, few places in the world can rival the simply mesmerising ruins of Machu Picchu in Peru. Officially named as the Argentine Republic, Argentina is an exciting Latin American country and borders the South Atlantic Ocean. The Argentinean scenery is extremely varied and ranges from beautiful sandy beaches and coastal resorts, to the wondrous snowcapped Andes mountain range, which remains the largest mountain range in existence. Located in the North Atlantic Ocean, the Commonwealth of the Bahamas is an island nation in the Caribbean. For many, Barbados is everything that you could imagine the Caribbean to be - sumptuous white sandy beaches fringed by palm trees, endless water sports and plenty of upmarket holiday resorts to choose between. The islands of Bermuda are known to many locals as simply Somers Islands and form the oldest remaining British overseas territory. Located to the east of the USA, Bermuda is made up of the parishes of Devonshire, Hamilton, Paget, Pembroke, St. George's, Sandy's, Smith's, Southampton and Warwick. As Latin America's largest and most densely populated country, the Federative Republic of Brazil is packed with interest for tourists. Brazil is to be found directly north of Argentina and lies next to the Atlantic Ocean, where many breathtaking, sun-drenched sandy beaches await holidaymakers. Lying within Central America, the Republic of Costa Rica is close to both Panama and Nicaragua, and sits next to the Caribbean Sea and Pacific Ocean. Beautiful sandy beaches are in plentiful supply along its 'Central Pacific' coastline, while the southern side of Costa Rica is rainforest country. The Republic of Cuba is a unique country, with a rich Spanish heritage and a population of some 11 million Cubans. 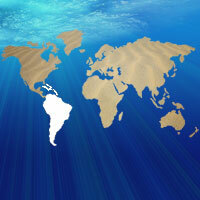 Located to the south of the USA, Cuba is close to the Cayman Islands, Jamaica and Mexico. The Republic of Guatemala is an important country based within Central America, where it is neighboured by Belize, El Salvador, Honduras and Mexico. The island nation of Jamaica is situated within the Caribbean Sea, where it is a part of the Greater Antilles archipelago. With tropical weather and lots of sun-drenched beaches, it is easy to see why Jamaica entertains such high numbers of holidaymakers. South America's Republic of Peru draws large numbers of tourists each year, many of which come to discover its ancient civilisations, including Peru's world-famous Inca Empire. Sited on the north-eastern side of the Caribbean Sea, the Commonwealth of Puerto Rico is an archipelago nation, with a sizeable main island. Both the Playa Flamenco and the Playa Luquillo are especially notable beaches, along with Tres Palmas. The Republic of Trinidad and Tobago resides within the southern Caribbean and close to Venezuela. Although this archipelagic state comprises many different islands, it is Trinidad and Tobago that remain the two most significant islands. The Bolivarian Republic of Venezuela is the sixth-largest country in Latin America and offers an especially diverse landscape, made up of mountains, rainforests and waterfalls, including the record-breaking Angel Falls.